Jean-Luc Picard (Patrick Stewart) in the "Star Trek: The Next Generation" episode "All Good Things." 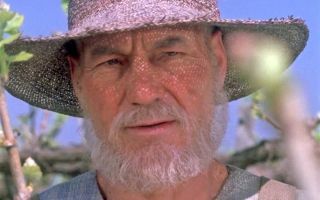 Where could a new Picard-centered series take him? Only a few days ago, "Star Trek" fans throughout the galaxy were treated to the news that Patrick Stewart will return to "Star Trek" to play the much-loved Jean-Luc Picard. What do we know about this so far? Stewart is the only confirmed cast member at this point, and we know that Stewart is also on board as an executive producer. While we don't know the exact timeline, we do know the new show will take place after the events of "Star Trek: The Next Generation" (TNG) and some 20 years after "Star Trek: Nemesis" (that would be 2399), so Picard will be portrayed at the correct age. Many of the people Jean-Luc Picard has met and interacted with during the history of TNG now have their own back stories and adventures, so it's hard to develop alternative stories that remain totally consistent. A cursory glance on the fan encyclopedia website Memory Beta reveals how complex these are. The "Star Trek" canon is a murky world. Memory Alpha details events and history based on what we've seen of "Star Trek" on TV and in the cinema, but Memory Beta focuses more on events and history from the novels, comics and the expanded universe. Also in the expanded universe, Picard marries Doctor Crusher, and they eventually have a son in December 2380 (TNG novels "Death in Winter" and "Greater Than the Sum"); however, this goes against events in the TNG episode "All Good Things," where we see they've divorced. So, it can be a little bit complicated, and there's definitely no shortage of story arcs to take inspiration from. And indeed, many of the TV writers do. In fact, several of the writers for "Star Trek: Discovery" started by writing "Star Trek" novels, including Kirsten Beyer, who will also be involved in the new series. However, that extended canon has been known to change for the sake of what larger audiences are shown in the cinema or on TV. Just look at "Star Wars," and the Marvel and DC superhero movies. Jean-Luc Picard (Patrick Stewart) in the "Star Trek: The Next Generation" episode "All Good Things." Speaking to Deadline, CBS Television Studios President David Stapf said, "My goal is that there should be a 'Star Trek' something on all the time on All Access." Can you imagine a 24-hour "Star Trek" channel?! Only in our dreams has this existed. Julie McNamara, the organization's executive vice president of original content, told Deadline, "We've really talked about virtually all of the characters who popped up in 'Discovery' as potential spin-off shows. It's obviously very much driven by our conversations with Alex Kurtzman's [production company] Secret Hideout and the other creators involved. I wouldn’t say at this point that we are actively pursuing a Michelle Yeoh series, but it has been discussed. "He definitely falls in that category of, it could be interesting to build around this character," McNamara said. "But, I will say, it hasn't progressed any further than that." Stapf told Deadline, "I think what you are asking is, are we incubating things potentially, and the answer is yes and no. There's not a grand design of 'Let's plant a Rainn idea and see how that does.' It's more Secret Hideout, and the rest of the Trek brain trust coming to us and saying, 'We think this would be really cool, story-wise, character-wise.'"